Shooting Journal - What's in it? I've read more than a few times on here that many of the high performing shooters will record all of their shots in a shooting journal. I'm curious to know what actually would go into this. Anyone willing to share a picture of a page or two from theirs? Re: Shooting Journal - What's in it? I've seen many shooters with the Hebard shooting log (in which each page basically looks like a 'standard' scorecard) with which they record every shot value. There's this log available from bullseyegear.com that looks like it might be useful, too. When I'm at a match, I merely record my target scores, and then calculate match scores and aggregate scores from those (chiefly to know how I did overall, and to make sure my scorer and I agree on my scores). I've posted this before. I take pictures of my score cards and enter them into the attached spreadsheet when I get home. I keep notes on my cell which I copy into the spreadsheet as well. I used to enter scores in a booklet but found that I got too focused on score and at the end of a match it was getting in my head if I was close to a personal best. Now I just jot down a few things like how many clicks I make and what the conditions were. If I had a good day I would write that down and add what I need to work on next time. I agree with bdutton. Scores should never be in your logbook. I save the match results emails for every match I have ever competed in to track that part of my path, but I rarely look at it. Focusing on score over process is ALWAYS an error for me. It creates anxiety and creates goals that are based on score instead of successful process---by the way, successful process is a 10 or an X, and that will result in a good score. 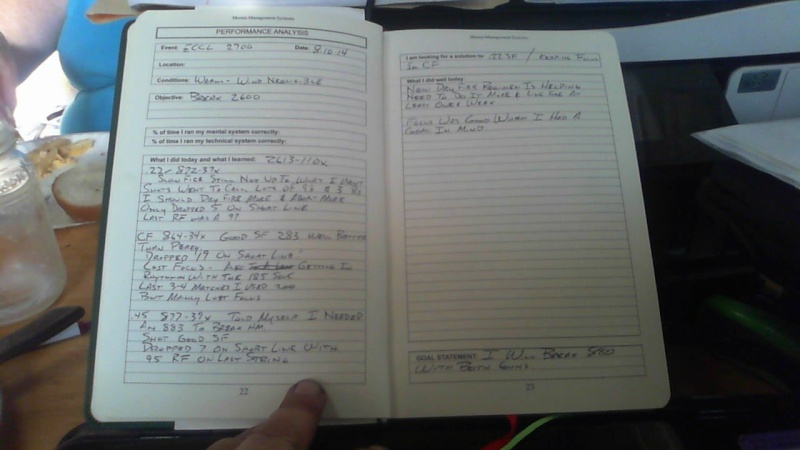 Your logbook should be an accounting of the things that went well that match, that practice day, that dryfire session. Imprint the good. Never critical of the bad--a note about what you are going to do to improve a weak part of your process is a better tool. That imprints doing the new process. Rob Kovach wrote: Scores should never be in your logbook. I do enter scores (and nothing else) in my "logbook" (really, just a notepad that lives in my clipboard along with my pens and scoring overlays). Then I put my logbook away when I'm shooting (my clipboard goes in my cargo pocket or on the bench). Perhaps I am fortunate to be able to not focus on scores while the gun is in my hand, but I haven't found the practice detrimental to my shooting. I don't get too 'granular' with my score recording, though - I don't write down the value of every shot (e.g. "X X X 10 10 9 9 9 8 8"). When I get home, I enter my overall match score into a spreadsheet, and the result (if known - sometimes I don't know where I placed overall until a couple weeks later when I get the results), and the guns I used and any mental notes about the match, overall. Often I'll want to go back and see how my overall score from the latest match stacks up against my overall scores from previous matches. Sometimes I'll want to know what guns I used way back when. Never have I wondered what my .22 slowfire score was three years ago, nor what my sight settings were in 2012, or what the weather was like in that match two weeks ago. I'd say that a competitor can write anything he/she wants into their logbook. They can be as detailed or as vague as they want, depending on what the shooter cares about. What I suspect the high-level shooters are particularly good at is clearing their minds of any extra thoughts when their fingers wrap around the grips of their pistols. A shooting journal's purpose is to keep you from making the same mistakes over and over. It is not the same as a log book. Recording scores can be good or bad, depending on the shooter. I like to see a lot of X's and 10's on my score sheet. It inspires me. Others might shoot better if they ignore the scores altogether. I don't see any need for pistol shooters to record each shot location. Pistol is not the same as rifle. 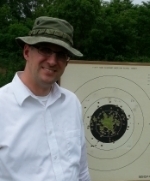 If the group is off-center and the first target of the match or at 25 yds, I write down the sight change I need to make when I can handle the gun (i.e. 2 clicks right). If the target is in the middle of the match and I didn't call my shots in that direction, I just note the location (i.e. 10 ring left) in case something has changed (loose sight? light conditions? something I'm doing wrong!). The shot process is just that - Everything you need to do deliver the best shot possible. It should include how you get your stance & grip, what you think about before and while you raise and settle, what image you look for to initiate the trigger, what you mentally focus on during the shot, how you pull the trigger and what you do after the gun goes off. It should be quite detailed. What works for you is a section of everything that helps you shoot well. It can include what you should eat (and what you shouldn't), what music you listen to on the way to the match, what clothes and shoes work best, what mental imagery and self-talk works best or anything else that works for you. When you find something that helps, write it down. Before a match or training session, review it. This reminds you of what you need to do and it also puts your head in a good place by thinking about other times you have shot well. The equipment log includes any information about the setup of you gun but especially which ammo works best and what the sight change is between distances. Everything else is self explanatory. If you find several notes in a particular area, maybe you need another section in your notebook. It might be a holding area for any stray thoughts during a match (grocery list etc) so if they are written down, you brain doesn't need to think about it. I have a section in my notebook for range info. The most important info is if you need to make a sight change when you go to that range. This is much more common for rifle than it is for pistols with dot sights. The first time I go to a new range I note how long it took to drive there, any landmarks to remember, nearby restaurants and hardware / discount stores, bathroom facilities etc. I almost put Goals and Training plan in the "required" section above. The most important thing is to start using one. The shooting notebook you start now will probably not be the same thing you use 5 years from now. It will evolve. Just start writing things down and periodically think about how you use it and how it can be improved. I use Lanny Bassham's Journal. You could use anything but I like the format. The most important thing is that you put things in it that help you improve. For me, the most important parts of my journal are that when I shoot well, I write a lot. I want to have that to refer back to, either when I'm struggling, or because I'm switching contexts (going from international rapid fire, to bullseye, to free pistol, to service rifle, to air pistol, etc.) You never know what might be important, so write it all down on those days when you excel. The other important thing, as mentioned, is to keep notes on different ranges: "Targets turn quickly at SF police range, but you get the full time"; "Usually dark on the Munich 25-meter range, but the targets are very bright - bring a filter"; "The Sacramento range is cold; bring a hat and handwarmers, and try to get there early to get a spot under a heater", etc. I ask for my score cards at the end of the match. They provide a great record of what areas you excel and what areas you need to practice. This is all great info... Thanks sixftunda for the picture! Anyone else able to share a picture of their journal? I use the same journal as Sixftunda. I could show you a picture but it would look the same! Mine doesn't have those scores in it though!